The Internet is abuzz with global warming issues which have polarised those who believe that humans are causing catastrophic global warming against those who believe this is not so. A United Nations panel (IPCC) was established to study the matter in order to advise governments of necessary action. Then Climategate exposed how this small group of people defrauded the truth. All this time an urgent need existed for a web site that clearly and concisely explains how the planet's climate works and how it varies, yet in a way that ordinary people can understand, while totally devoid of politics, beliefs and ulterior motives. Read on - with care. Be amazed about how rotten science has become and who are the perpetrators of this scandal. www.ipcc.ch/ - IPCC home page where its assessment reports can be found. www.uoguelph.ca/~rmckitri/research/ISPM.pdf - Independent Summary for Policymakers of the IPCC Fourth Assessment Report (Working Group 1) (64 pp) An alternative and more realistic summary than that of the IPCC. A concise history of the greenhouse effect, by Timothy Casey: http://greenhouse.geologist-1011.net/, describing the work of Fourier, Tyndall, Arrhenius and others, also clearing up some misunderstandings, showing that CO2 has no effect. www.aip.org/history/climate/ - the history of climate research. by Spencer Weart with many links. Note a pro-AGW site! Large and detailed but somewhat naive.Historical gems. www.climate4you.com/ a treasure trove of climate data and explanations. Reliable. www.appinsys.com/GlobalWarming/ - reliable information about global warming with hundreds of graphs and maps. members.shaw.ca/sch25/FOS/Climate_Change_Science.html - Climate Change Science by Ken Gregory educational and succinct. Important reference! web.me.com/uriarte/Earths_Climate/Earths_Climate_History.html - Antón Uriarte (2010): Earth's climate history. An extensive and unbiased account. http://ceos.snes.fr:8100/cdron-98/ceos1/science/dg/dgcon.htm -: Dr D C Griersmith (2000): A review of atmospheric characteristics: general principles. CEOS is the Committee on Earth Observation Satellites. http://www.populartechnology.net/2009/10/peer-reviewed-papers-supporting.html900 papers critical of AGW. An excellent compilation of peer-reviewed papers. http://www.trevoole.co.uk/Questioning_Climate/Climate_Facts_for_Policymakers.pdfQuestioning Climate for Policymakers by Jonathan Drake. easy reading. Begin your study of planet and sea at the Seafriends home page or our sitemap. The whole section covers about MB, including text, drawings and photographs. Buy our CD or make a donation. The climate, and with it temperature, is of critical importance to the functioning of society and people's well-being. Because a human generation lasts no longer than 60 years, excluding early childhood and senility, we see only a short period of the courses that climates are taking. So we are inclined to think that the world around us remains in a steady state, that tomorrow is like yesterday. And indeed, the world's climates have been remarkably steady. But recently, we have been witnessing some warming, while at the same time the awareness arose that perhaps we, ourselves, were the cause of this warming. The obvious culprit is thought to be carbondioxide emitted by industry and our comfortable way of life because it has long been known that it blocks part of the 'thermal' infrared radiation. For example, our 'sister' planet Venus has an atmosphere consisting of carbondioxide, and its temperature is very much higher than expected, measuring over 400 degrees Celsius, more than enough to melt lead. So more and more people became concerned that the same fate, run-away global warming, may befall Earth, or Catastrophic Anthropogenic Global Warming (CAGW). It didn't take long before the vast majority of people were drawn into this scare scenario, predicting catastrophes from melting ice caps, rising sea levels, floods, diseases spreading, loss of species, dying corals and sea life, and much, much more. World conferences were organised to jolt politicians into action, which led to the inauguration of the Inter-governmental Panel on Climate Change (IPCC) to advise what is happening, how serious, and what to do. In the meantime, the World Wide Web matured, reaching billions of people with millions of pages of scary predictions. There appeared universal consensus (by the 'warmists') that 'the science was settled' and that it was now time for action - very costly action. IPCC: The greenhouse effect is real; it is a well understood effect, based on established scientific principles. However, in reality, the science is far from settled, and skeptical scientists (the 'skeptics') who had been blocked from the scientific process, began to use the Internet to disperse criticism and alternative observations and explanations. This is where I became involved, and from here on, this introduction is about my (Floor Anthoni) personal motivations and observations. Rewind to 1987 when I began to realise that the seas around New Zealand were degrading at an accelerating rate. It motivated me to stop doing what I did (computers and electronics) and to begin 'saving the sea'. That meant a lot of re-schooling (in marine ecology). I soon realised that education was the key to conservation because we need to learn more before we can 'do the right thing for the right reasons at the right time'. In 1997 the Internet led the way, and I began writing this very large educational web site. My aim is 'accelerated learning' such that the reader can learn 100 times faster than I did. With very large chapters like oceanography, soil, degradation and ocean acidification already completed, a large chapter about climate and global warming was just the next step. I expected that this would have been done by someone else a long time ago, but to this day, there is no web site that could qualify. Sure, there are scores of extensive web sites, both in the 'warmist' camp and in the opposite camp, but one can easily get lost in the way they confuse. A site is needed that provides critical step-by-step learning, while dissecting the science and throwing challenges in as well, and all that without bias. But you need to open your mind, because there is a lot of science to learn, and many new viewpoints discovered by myself. Chapter 1: Marble in space. The world hangs by an imaginary thread between the hot sun and cold space. It has managed to stabilise its temperature somewhat but large swings (the ice ages) are still there. Here you'll learn about imaginary atmospheres to understand ours, and about albedo, Milankovic cycles, the restless sun, the influence of cosmic radiation and other influences. You will also learn about the major faults in the IPCC's theory of heat transfer by thermal radiation. The debate about global warming from carbondioxide, should have ended here. Chapter 2: Water, ice and vapour. Water is the strangest, yet most common substance on Earth. Many of its strange properties are what stabilises the climate, causes ice ages, and most importantly, on which life depends. You'll learn about its physical properties, humidity, latent heat, ice shelves, glaciers and ice ages. Much of this chapter contains 'old' knowledge, presented in a new way. Chapter 3: Measuring temperature. It is surprisingly difficult to measure temperature in a way that matters to understanding climate and its changes. You'll learn about thermometers, the Stevenson Screen, Urban Heat Island effects, weather balloons, paleothermometers, proxies and where the heat content of Earth is found. You will also learn about the massive frauds that have been committed to make it seem that Earth is warming faster than ever before. Chapter 4: Anthropogenic global warming, or how fossil fuels are thought to warm the planet and cause climate change. You'll learn about the IPCC and its computer models, to discover that a massive fraud is in the making. You'll learn about hockey stick graphs and the basis of proof offered by the IPCC. You will learn about the science in support of AGW and where it fails or leaves doubt. Also in this area there has been much deliberate fraud. Chapter 5: Greening planet. Both rising temperatures and rising carbondioxide concentrations are very beneficial to all life. Here you'll discover the positive sides of carbondioxide and how plants react. Chapter 6: Miscellaneous gems from the Web. Now and then a gem of wisdom is found in blogs, comments and other postings, here saved for posterity. An interesting read but you can skip it if you like. Chapter 7: What is natural climate change? What natural climate forcings have been working long before humans existed, and how do these influence the climate? Do they explain recent warming and future cooling? Do they refute the global warming scare? This chapter is based on the seminal work of Dr Joseph Fletcher whose seminar (Jul 2000) has been reproduced here, in his own words. The wind factor has been overlooked by the scientific community. Very important reading and uniquely, only on this site! Ocean acidification: the scare industry migrated from global warming to climate change to ocean acidification but here you'll discover how the ocean's chemistry really works, what is known and not known, and why so many experiments have been fraudulent. Oceanography: about the oceans, the biggest part of Earth by far. You'll discover how waves work, tides, storms, dunes and beaches and much more. This also contains the circulations of water and air and how climate and weather are formed around the world. Soil: this very large chapter introduces you to our most important resource, how it is formed, what lives on it and where and why, and how we are losing both its quality and quantity, and what we must do. It also makes you understand the major biomes/habitats in the world. When all is said and done, our major concern should be with the loss of soil and water. Conclusion? A conclusion is not needed. Just let the facts speak for themselves, try to UNDERSTAND and make up your own mind. Is the IPCC report accurate, inaccurate or fraudulent? Is climate understood, poorly understood or misunderstood? Is 'climate change' natural or caused by humanity? Is warming inconsequential, worrisome or catastrophic? Is the science (knowledge) settled, not settled, mainly absent or corrupted? Etc. In no other branch of science is the science 'settled' or the evidence 'incontrovertible'. This is strong evidence that Climate Science is not science at all. I am indebted to the many scientists who often spent their entire career trying to extract meaningful data from the past. I have also been fortunate with the development of the Internet and am equally indebted to so many people who shared their ideas so unselfishly. Yet so much confusion has been caused and spread by so few dishonest people. Thousands of papers have been published, yet so very few are worth citing. Finally, don't be intimidated by the amount of time needed to study all of the above. Think for a moment how much time it has taken me to put it all together and for thousands of scientists to deliver the data. I have included many drawings and graphics so you won't need to worry about the calculations. Even so, it is only natural to read some of it several times. Spend time studying the graphs because they have great stories to tell. And if there are things that are not quite clear, or should you find mistakes, e-mail me so that it can be fixed. If these chapter were useful to you, tell others, as many as you can and as soon as you can. Link to this chapter from whichever website. If you are financially comfortable, consider making a donation. Together we can make a better world. I am not a climatologist but have a keen eye for observation, a wide interest in science and a critical mind trained in analysing big problems, breaking them apart and finding the rules within. I am not paid by anybody. This is a labour of love, a gift to future generations. The global warming scare has divided the world unevenly into three camps: the warmers, the warm skeptics and the cool skeptics. It is an indication that the science is not at all settled, as claimed repeatedly by the warmists. The warmists believe that Earth's surface and atmosphere are cooled by out-radiation, warmed by re-radiation and back-radiation, as proclaimed by the UN IPCC. Their hypothesis states that CO2 increases back-radiation and thus temperature. Worse still, they assume that a slight warming releases more of the natural warming gas water vapour and that this causes positive feedback (amplification). When programmed into their computer models, predictions of warming become indeed quite dire, reasons to be extremely worried, they say. About 99% of the world and nearly 100% of the media support this, and banks too, as they see the trade in carbon credits as a sorely needed new financial bubble and cash cow. Literally tens of thousands of scientific articles and tens of millions of news articles, blogs and comments are based on this hypothesis. Yet no effect has ever been measured - Keep this in mind!. The warm skeptics (my terminology) believe in the IPCC warming hypothesis but think that the warmists exaggerate their claims. Instead of 3.5ºC for a doubling of CO2, their estimates are 0.7-1.5ºC. These people are still in a very small minority and are not backed by the media, neither do they share in the rich CO2 handouts/subsidies. These people also point out that more CO2 is good for everyone including nature, and so is some warming up to 5ºC. Some 30,000 scientists signed a statement to that effect. No reason to worry. The cool skeptics (my term) claim that CO2 has no effect on temperature whatsoever. They arrive at this conclusion by understanding the physics of the atmosphere which insists that the surface and the lower atmosphere do not cool by out-radiation etc, but by contact, conduction and convection. The cooling rate is indeed identical to that of the planet Venus which has an atmosphere of nearly 100% CO2 (2500 times as much). They are backed by several hard facts, but their numbers are indeed very small, too small to be heard. * Global temperature is rising more slowly than IPCC’s least estimate; No rise for 18 years.In 20th century not exceeding natural variation. * Global sea-ice extent has changed little in 30 years;Antarctica has expanded. * CO2 follows temperature and not the other way, both seasonally and in ice ages. Thus CO2 does not cause warming. Here is a time line of important events in the history of climatic research and the narrative of manmade global warming. 1824: greenhouse effect discovered by Joseph Fourier, published in: Mémoire sur les températures du globe terrestre et des espaces planétaires. He later rejected the idea. At the time electromagnetic radiation was not known, and scientists thought that energy was transferred by an invisible substance, called aether. A concise history of the greenhouse effect, by Timothy Casey: http://greenhouse.geologist-1011.net/, describing the work of Fourier, Tyndall, Arrhenius and others, also clearing up some misunderstandings. 1861: John Tyndall published that certain gases can absorb thermal radiation. 1896: Svente Arrhenius proposes a Greenhouse Warming hypothesis, which posits that global warming could occur due to Man's activities. He calculates +1.5ºC for a doubling in CO2 and that a complete absence of CO2 could cause -14.6ºC cooling, by far enough for a new ice age. It is based on the assumption that heat is re-radiated entirely. 1900: K Ångström's experiment with CO2 showed: 1. CO2 is transparent to 90% of infrared radiation applicable to temperature variation. 2. Those infrared bands that CO2 readily obstructs are already almost totally blocked by atmospheric CO2. It essentially means that increased CO2 has no effect. 1909: Möller (Germany) writes an influential textbook on meteorology formulating the greenhouse effect on radiative transfers. 1939: François E. Matthes introduces the term Little Ice Age (LIA) for the cooling period between 1550 AD and 1850 AD after the Medieval Warm Period (MWP) and notes three particularly cold intervals: one beginning about 1650, another about 1770, and the last in 1850, each separated by intervals of slight warming. 1948: the IUCN (International Union for the Conservation of Nature) is formed by Sir Julian Huxley, a Life Fellow of the British Eugenics Society. 1956: Gilbert Plass did a detailed study of the absorption spectra of atmospheric gases and concluded that a doubling of CO2 could increase surface temperature by some 3 degrees C.
1957: Revelle & Seuss quote: "Thus human beings are now carrying out a large scale geophysical experiment of a kind which could not have happened in the past nor be reproduced in the future. Within a few centuries we are returning to the air and oceans the concentrated organic carbon stored over hundreds of millions of years." 1958: accurate CO2 measurements begin at Mauna Loa under the watchful eye of Charles D Keeling, initiated by Roger Revelle, director of Scripps Institution of Oceanography. 1960: young astrophysicist Carl Sagan popularises the greenhouse effect on Venus. 1962: The UN General Assembly invites the Council of Science Unions (ICSU) and World Meteorological Organisation (WMO) to develop a research programme on atmospheric sciences. 1964: The ICSU committee on atmospheric sciences is created, chaired by Bert Bolin, an early computer modeler. 1967: The Global Atmosphere Research Programme (GARP) is established, with chairman Bert Bolin. 1970-75: scare rages for a coming ice age. 1970: First World Earth Day, Barcelona Spain. Of primary concern were overpopulation and catastrophic global cooling. 1972 april: first Earth Summit in Stockholm. Catastrophic Anthropogenic Global Warming (CAGW) is proposed by Maurice Strong. The UN Environment Programme (UNEP) is established. 1972: Alfred Shack showed that the radiative component of heat transfer by CO2 can be neglected at atmospheric temperatures, thus proving that CO2 cannot have an important or even measurable effect on climate. 1975: The first use of a General Circulation Model to study the effects of carbon dioxide doubling, by Syukuro Manabe and Richard Wetherald at Princeton University. 1976: Jack Eddy discovers the importance to climate of periods with little or no sunspots, explaining the Little Ice Age and the Maunder Minimum. 1979: satellites begin measuring sea ice extent. 1979: First World Climate Conference in Geneva: it confirmed the long-term significance of CO2 for global climate. 1980: GARP becomes the World Climate Research Programme (WCRP). First Villach conference on climate. 1982: Syukuro Manabe & Möller (Germany) influential textbook on meteorology, in which the greenhouse effect is calculated from radiative transfers (false). 1985: the US Department of Energy's comprehensive report on the greenhouse hypothesis becomes the basis for the IPCC, setting thermal conductivity and friction to zero, which is not how the atmosphere works. 1986 Jul: WMO and UNEP establish the IPCC. Key personnel and lead authors appointed by governments. 1987: The Brundtland Report "Our Common Future" appears for the UN World Commission on Environment and Development (UNWCED), igniting today's green movements. Maurice Strong is a main protagonist. 1988: UNWCED conference in Toronto calls for a reduction in CO2 emissions to 20% of 1988 levels by 2005. 1988: James Hansen, of NASA's Goddard Space Flight Center, appeared before a Congressional committee in the summer of 1988, during one of the hottest months on record, and declared that there was no denying it, "Global warming is here!" 1989: Stephen Schneider discloses several tricks: "To capture the public imagination, we have to offer up some scary scenarios, make simplified dramatic statements and little mention of any doubts one might have. Each of us has to decide the right balance between being effective, and being honest." 1989:The Royal Society UK publishes the pamphlet"Greenhouse Effect – the Scientific Basis for Policy", thereby abandoning its scientific objectivity and independence. 1992 June: UN Framework Convention on Climate Change (UNFCCC):is an international environmental treaty to stabilise greenhouse gas concentrations in the atmosphere at a level that would prevent dangerous anthropogenic interference with the climate system, signed by 194 parties and 154 nations who meet annually in COPs, (Conferences Of the Parties).This convention with its secretariat in Bonn,has had a major influence on the IPCC and its reports.Article 3.3 defines that uncertainty is no excuse for inaction, and that the precautionary principle (prevention) must prevail. 1992: UN Conference on Environment and Development ('Earth Summit') in Rio de Janeiro. Adoption of Agenda 21, a global contract that bound governments around the world to a U.N. plan to change the way people live, eat, learn and communicate, all in the name of saving the earth from mankind’s mistakes, particularly global warming. 178 governments signed there and then. Scretary-General Maurice Strong, told the opening session that "industrialized countries had developed and benefited from the unsustainable patterns of production and consumption which have produced our present dilemma." and "Isn’t the only hope for the planet that the industrialised civilisations collapse? Isn’t it our responsibility to bring that about?" 1996: SEPP (Science and Environmental Policy Project) publishes its Leipzig Declaration and a book titled The Scientific Case Against the Global Climate Treaty. COP2 in Geneva. 1997: COP3 in Kyoto.Fully 160 countries agreed to the legally binding Kyoto Protocol, under which industrialized countries would reduce their collective emissions by 5.2%. The Protocol expires in 2012 and needs to be renewed with even more stringent emission cuts. 1997 Sept: Sir Robert May, Fellow of the British Royal Society publishes his influential but biased report on climate change: link.Unbelievable, showing the 'warmists' beliefs in a nutshell. 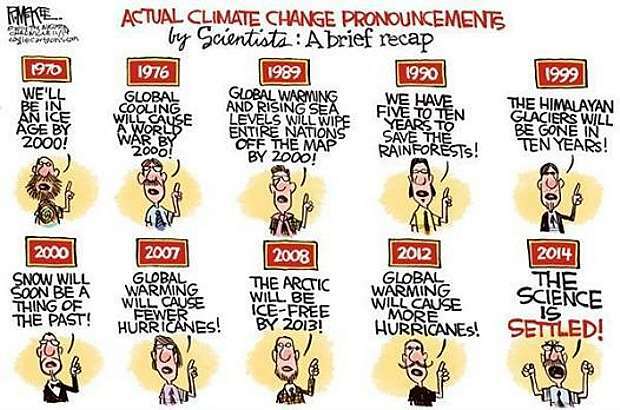 Also introduces the vague and unmeasurable concept of 'climate change' instead of measurable 'global warming'. ! 1997: the Pacific Decadal Oscillation (PDO) was named by Steven R. Hare, who noticed it while studying salmon production patterns. Simultaneously the PDO climate pattern was also found by Yuan Zhang. Nations agree to reduce GHG emissions to 1990 levels. 2000 Jul: COP6 The Hague &Bonn. Dr Joseph Fletcher's seminal seminar revealing the major natural forces affecting climate. A must-read(on this site only). 2001: COP7 in Marrakech, Morocco. the IPCC produce their Third Assessment Report (TAR): "new and stronger evidence of anthropogenic global warming". "Most of the observed warming in the last 50 years is likely to have been due to the increase in greenhouse gas concentrations (greater than 66% probability".The IPCC concludes that today’s temperatures are warmer than in 1300 years. How it reached this conclusion is under criminal investigation. 2002: COP8 in New Delhi, India.SEPP rebuts TAR with a booklet The Kyoto Protocol is not backed by science. 2004: COP10 in Buenos Aires, Argentina. Convention on Biological Diversity.note that the scare propaganda migrated (changed) from global warming to Climate Change to Ocean Acidification to loss of biodiversity. 2005 Feb: 55 Nations agree to their Kyoto commitments by 2012. 2005 Nov: COP11 in Montreal, Canada. Lawrence Livermore Laboratories announced that "if humans continue to use fossil fuels in a business-as-usual manner for the next few centuries, the polar ice caps will be depleted, ocean sea levels will rise by seven meters and median air temperatures will soar to 14.5 degrees warmer than current day..."But proof and evidence elude. 2006 May: Al Gore produces the slideshow/movie 'An inconvenient truth' view/download. 2006 Nov: COP12 in Nairobi, Kenya. 2007: the IPCC produce their Fourth Assessment Report (AR4): "most of the observed increase in global average temperature is very likely (90% likelihood) due to the observed increase in anthropogenic greenhouse gas concentrations", "Disernible human influences now extend to other aspects of climate, including ocean warming, continental-average temperatures, temperature extremes and wind patterns". But proof eludes.The IPCC twice concludes that the rate of warming is speeding up and we are to blame. But it uses a false statistical technique to reach its conclusion. 2007 Feb: Nongovernmental International Panel on Climate Change (NIPCC) was established to counteract IPCC's spurious claims. "the IPCC is provoking an irrational fear of anthropogenic global warming based on incomplete and faulty science." 2007 Mar: the movie 'The Great Global Warming Swindle' exposes Al Gore's scientific exaggerations and fallacies.view. 2007 Apr: NIPCC conference in Vienna. 2008-2012: EPOCA European Project on Ocean Acidification to advance understanding of the biological, ecological, biogeochemical, and societal implications of ocean acidification. 2008 Dec: over 700 international scientists Dissent Over Man-Made Global Warming Claims - Challenge UN IPCC & Gore. more. 321pp-report. 2009 Feb: Japanese scientists break with the UN IPCC consensus. Climate science is 'ancient astrology' They have always been skeptical. [Japan Society of Energy and Resources (JSER)]. link. 2009 Nov: COP15 in Copenhagen, Denmark. Important e-mails from the IPCC 'climate gang' are leaked onto the Web. They show how a small clique of IPCC scientists acted to propagate a climate of fear for catastrophic global warming and how they defrauded the truth. Known as Climategate, a large number of climate skeptics discover one scientific fraud after another. Read a complete analysis of the leaked Climategate emails and what they mean, by John P. Costella. Joanne Nova's amazing climate gate timeline. 2010 Jun: climate scientists statement : “We, the undersigned, having assessed the relevant scientific evidence, do not find convincing support for the hypothesis that human emissions of carbon dioxide are causing, or will in the foreseeable future cause, dangerous global warming." Thousands of signatures (31,000). 2010 Sep: three 'independent' inquiries were conducted into the conduct of scientists at the University of East Anglia, but these failed to go into depths necessary to expose fraud. For an extensive report read The Climategate Inquiries by Andrew Montford. Mann’s Hockey Stick, Climategate, and FOI – in a nutshell: a one-page summary by Anthony Watts (Jun 2011). NSF whitewash. 2010 Oct: hurricane scientist Prof Dr Judith Curry courageously describes her switch from warming believer to skeptic and defender of the integrity of science in Heresy and the creation of monsters. A must-read to understand why so many scientists have become complicit in the biggest scientific fraud ever. Read this profile too. See also our Hall Of Shame. Setting an example for others to follow? 2011 Jun: in prospect of the expiration (in 2012) of the Kyoto Protocol, by which nations promised to curb their CO2 emissions, large nations like USA, Canada, China, Russia, Japan already announce that they will no longer honour it. China, the world’s greatest CO2 emitter, and India are not bound to CO2 reductions in any treaty. Others may follow. Kyoto postponed! 2011 Nov: COP17 in Durban, South Africa. The Kyoto Protocol is dead but not the belief in catastrophic climate change. 2012 Jun: Climategate-2. A new batch of CRU e-mails is leaked to the public, confirming the first release. More. 2012 Jun: Durban Climate Conference, 20 years after Rio. Canada pulls out of Kyoto Protocol. 2012 Jun: through the UNFCCC, climate scientists (warmists) plead for immunity from criminal prosecution. 1. 2012 Sep: The likely list of “Kyoto 2" participants accounts for only 15-17 percent of global greenhouse emissions which makes the target of limiting the global temperature rise to no more than 2 degrees Celsius (3.6 Fahrenheit) above pre-industrial times impossible to reach. Russia bails out; making its own decisions(Reuters). 2012 Sep:German Academy Of Sciences And Engineering Calls Off Climate Catastrophe – Coping Will Not Be A Problem:"No climate conditions are going to occur here that do not exist already on the globe elsewhere and that we cannot cope with.”link. 2013 Sep:After a spectacular change of Australian government, the coalition (with Tony Abbott) that opposed Australia's carbon tax has announced the dismantling of significant (nearly all) climate change programs and their emissions trading scheme (ETS). It immediately abolished its new Climate Change Ministry. There has been no surface warming for 15-17 years!! How many nations will follow this sudden outbreak of reality, honesty and common sense? 2014 Jun: UN climate talks in Bonn fail because of economic reality, fracking and a boom in coal. Cold weather everywhere cooled minds too. 2015Oct: UN Climate Summit in Paris fails already before it began, because of developing nations drawing a 'red line' (ultimatum), and because previous commitments prove unattainable. The costs became unacceptable to voters subjected to energy uncertainty and accelerating costs, while more cheap energy is found in fracking, and global temperature has not risen for 20 years despite a continuing rise in CO2. 2015 Nov 28: Climate activist Maurice Strong dies. He saw the potential of the environmental movement to fight capitalism and introduce a system of “global governance” that would co-ordinate all human activity. 2015 Dec: 21st Conference of Parties (COP-21) of the UN Framework Convention on Climate Change UNFCCC November 30 to December 11 in Paris. 20171201 Minor corrections applied to all chapters. 20110820 - New Chapter7: What is natural global climate change? 15pp. Based on Dr Joseph Fletcher's lecture (2001) 24pp. Unique observations. must-read. 20110819 - Global average temperature in perspective, after graphs published by Erl Happ, in Chapter3. 20110816 - The effect of winds on global sea levels explained and how the world's average is misrepresented. Chapter4. 20110816 - Does the Stevenson Screen measure surface temperature? Has IR outradiation been measured? In Climate3. 20110813 - The work of Joseph Fletcher has largely been forgotten, but here is a whole chapter devoted to his revolutionary discoveries. 20110721 - The missing oxygen in chapter 4 updated with suggestions from Ferdinand Engelbeen. 20110720 - Chapter6 updated with more gems from the Web. 20110703 - Past temperatures added to chapter 3 to put present temperatures in perspective. 20110528 - Methane misconceptions added to Chapter 4. 20110416 - The temperature of the atmosphere of Venus between 0.2 and 1 bar is identical to that of Earth, proving that CO2 cannot have any influence on global temperature. Earth's 'greenhouse effect' is caused by the lapse rate of any compressible gas. 20110416 - Kiel&Trenberth radiation diagram is nonsense because energy transmissions within a system cannot exceed the energy entering the system. All global climate models are fraudulent because of this. 20110304 - Is polar temperature important and should it be included in the average world temperature? 20110123 - Extreme weather events of Dec 2010 ... explained, and threat of famines in Chapter 2. 20110104 - Jonathan Drake's research on the warming caused by the loss of thermometers added in Chapter 3. 20100804 - Chapter 3: temperature corruption. How is it done? What is the state of the temperature record? Why? 20100801 - Chapter 2: Does global cooling cause heat-waves? 20100620 - Chapter 5 Greening Planet added. 20100606 - placed the whole section on the Web. Chapter 5 in progress. More changes and additions to come.